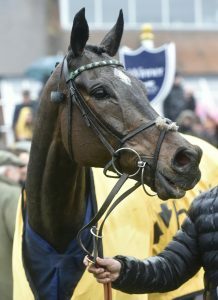 Altior, Beware the Bear and Pentland Hills, Nicky Henderson’s heroes from last week’s Cheltenham Festival, will parade at Newbury, on Saturday 23 March when the track hosts its last jumps fixture of the 2018-19 campaign. Altior underlined his status as one of the superstars of jumping when he took his unbeaten record over jumps to 18 by securing a second success in the Queen Mother Champion Chase. He will share the limelight with two stablemates new to the big race winning arena in Pentland Hills, winner of the Triumph Hurdle, and Beware The Bear, who captured the Ultima Handicap Chase. Nicky Henderson is also set to take the leading trainer title at the Berkshire track having saddled eight winners going into the final fixture. Adding to the celebratory mood there will be a special send-off for jump jockey Noel Fehily who, having announced his retirement last week when he rode his seventh Cheltenham Festival winner, will be riding for the final time. The rider of more than 1,300 winners in Britain, whose successes include two Champion Hurdles, a Champion Chase and two King George VI Chases, will sign autographs before racing at 1.10pm outside the Weighing Room. Fehily has three rides on the eight race card, Prabeni in the Be Wiser Insurance Juvenile Handicap Hurdle at 2.40, Outofthisworld in the Grade 2 EBF and TBA Mares’ National Hunt Series Final, the day’s feature race at 3.15, and Get In The Queue in the Goffs UK Spring Sale Bumper at 5.00. There will be a special presentation made to the jockey, 43, ahead of his final mount on the day in the Goffs UK Spring Sale Bumper, which will be attended by many of his family, friends and supporters. Finally, over the last week, the public have had their chance to vote of their Moment of the Season from a shortlist of six. With over 1000 votes, the winning moment will be awarded to connections of Carole’s Destrier, following his win in the Veteran’s Handicap Chase on Saturday March 2. Once again, the 11-year-old demonstrated his love for Newbury and delighted trainer, Neil Mullholland and owner Carole Skipworth.